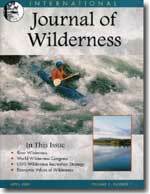 This issue of the IJW focuses on Alaska, in preparation for the 8th World Wilderness Congress (Anchorage, 2005). 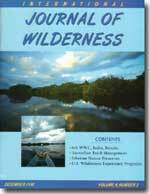 Some of the topics covered are how subsistence lifestyles, inholdings and ANILCA impact wilderness stewardship issues, the five most significant threats to Alaska’s wilderness, commentary on the character and soul of northern and arctic wilderness areas. Jon Kohl provides a stewardship article on the history of zoos as conservation centers, and calls for zoos to focus more on conservation instead of animal exhibition. 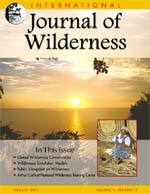 This issue of the journal celebrates a successful 10 years of publication. 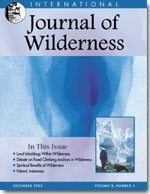 Several articles in this issue address the character of wild-nature, and the meaning and value of primitive experiences of solitude in wild-nature. 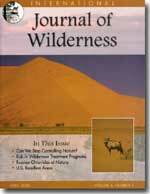 How can we manage for wilderness experiences? Mary Wagner contributes a stewardship article on the US Forest Service’s commitment to Wilderness and Wild and Scenic Rivers. Following the article is an interview with Mary Wagner. 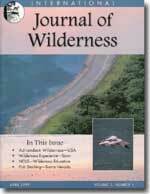 F. Patrick Holmes and Walter E. Hecox address the important question: Does Wilderness Impoverish Rural Regions? 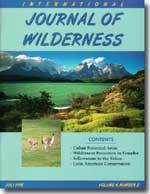 Drummond Densham contributes and international perspective for this issue of the journal, honoring Bill Bainbridge of South Africa for his receipt of an honory doctorate of law from the University of Natal for his distinguished work supporting and promoting wilderness conservation. The formation of The Wilderness Task of the World Commission on Protected Areas (WCPA) of the International Union for the Conservation of Nature (IUCN). The task for is co-chaired by Vance Martin, WILD’s President, and Khulani Mkhize, CEO of KwaZulu Natal Widlife. 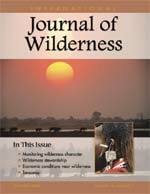 Sandra Slater-Jones contributes an article to this issue of the journal on the relationship between transfrontier park managers, policy makers and resident indigenous populations. She emphasizes the importance of cooperation between countries and protected area managers in transboundary parks, and a greater awareness of local, human issues. Linda Moffat writes a very interesting article on adventure racing in the wild, a use of wildlands that is under much scrutiny. She provides perspectives from adventure racers to create a balanced story of the impacts and benefits of adventure racing on protected areas. 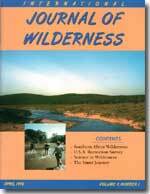 Vance Martin and Andrew Muir provide an overview of activities and outcomes of the 7th World Wilderness Congress, Port Elizabeth, South Africa (November 2001). 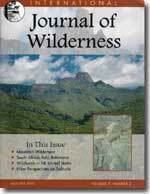 In the education and communication section, Maclom Draper and Alan Watson report on wilderness management workshops held prior to the 7WWC, which focused on the philosophy, history, and management of wilderness; making wilderness relevant to local and traditional people; and, sustainable financing of restoration and education programs. Vance Martin, WILD’s President, contributes an editorial perspective, in which he calls for us to remember that: the ecological services wilderness provides go to everyone on the planet; and, the power of wilderness to move people in a transformative way. He reminds us that “wilderness has soul.” Christopher Monz provides an overview of an evaluation of evaluating student satisfaction in wilderness education courses, specifically from the National Outdoor Leadership School (NOLS). John Shultis reviews several books including “Edward Abbey: A Life” by James M. Calahan. This IJW features an article by Stephen Mills on how the Sierra Club reaches “Beyond the Borders” with its new international programs in Southern Africa, Mexico and the Ashoka fellows program. In the international perspectives section, Stephen Siebert and Jill Belsky discuss the important role of local food production in livelihood security and why protected area managers need to be aware of these issues. In the news and announcements section, WILD announces its WILD Awards program, recognizing companies who use wild images in advertising and also support the protection of wild nature – in an way, paying royalties for the use of these images. Garry Oye and others provide personal perspectives on the new wilderness recreation strategy for the National Forest System in a special stewardship feature. 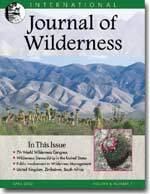 The working partnership between the Bureau of Land Management and the Student Conservation Association to restore wilderness in the California desert is explained by Dave Wash and Kate Wash. Chad Dawson remembers the work, leadership and passion of Bob Marshall, and John Shultis reviews For the Health of the Land by Aldo Leopold (J. Baird Callicott and Eric T. Freyfogle, eds). Michael Frome contributes a moving piece for Soul of the Wilderness, discussing the wilderness as a sanctuary for us and future generations: “Wilderness areas are not playgrounds, nor theme parks, but sanctuaries, meant to be forever.” Franco Zunino contributes an international perspective on his work to bring the concept of wild nature to Italy and the mountainous wilderness landscape he and partners work to protect. 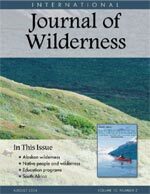 In this issue of the journal, Alan Watson contributes perspectives from the Aldo Leopold Wilderness Research Institute on the wilderness values in the circumpolar north. Tarun Chhabra contributes an international perspective in his article on the Toda people of the upper Nilgiri plateau in southern India. The Toda culture has a rich and sacred connection to wild nature, specifically the buffalo and its milk and the wildland plants used in rituals, medicine and daily activities. The Wilderness Digest section announced the Bureau of Land Management primitive skills team winning the first Corrigall Wilderness Stewardship award. 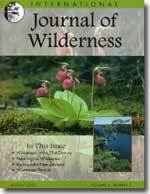 In this issue of the IJW, Kevin Proescholdt presents events and milestones of the Boundary Waters Wilderness, the most visited unit in the US National Wilderness Preservation System. 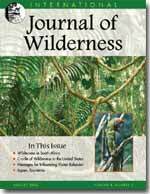 David Parsons contributes to the Wilderness Digest with News from the Aldo Leopold Wilderness Research Institute. Parsons describes how science is essential for understanding and managing wilderness areas, and in turn how wilderness provides opportunities to scientifically explore (relatively) pristine areas. 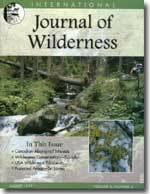 In this issue’s Soul of the Wilderness article, David Cole addresses the conflicting, desirable and important values of wilderness: wild, natural, un-crowded and free. John Shultis contributes commentary on how humans, while ultimately fearing that technology will destroy man-kind, increasingly rely on technological innovations to enjoy wilderness experiences. 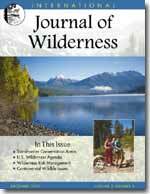 Ken Cordell and Jerry Stokes provide a perspective from the Forest Service on the social value of wilderness. 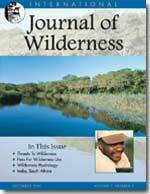 Luna Leopold, son of Aldo Leopold, contribute to this issues Soul of the Wilderness. He talks about the experience of fear in a wild-landscape, and the clarity this provides in the context of modern life, science and technology. A team of authors (Arsuffi et. al.) provide a stewardship article on the San Marcos River Wetlands Projects, including restoration efforts and environmental education projects. A very interesting study is featured in the Science and Research section of this IJW. “Health-Related Knowledge and Preparedness of High-Altitude Wilderness Hikers in Colorado,” surveyed 126 hikers in Rocky Mountain National Park as to their knowledge of common wilderness-related illnesses and their level of preparedness for these issues. A large percentage of those interviewed were not prepared or knowledgeable about high-altitude risks. The majority of respondents were not adequately acclimated to the altitude prior to beginning their excursion. In the International Perspectives of this IJW, Andrew Muir describes Imbewu and the Opinion Leader Programmes of the Wilderness Leadership School. Both of these programs are aimed to rekindle the bond between South Africans and their land, a bond alienated by policies of colonization and apartheid. Also in this issue, John Shultis reviews two books: “Wilderness by Design: Landscape Architecture & the National Park Service,” by Ethan Carr; and “Building the National Parks: Historic Landscape Design and Construction,” by Linda Flint McClelland. 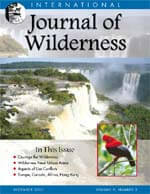 WILD’s President, Vance Martin contributes a feature titled “The Trail Ahead” in this issue of the IJW. 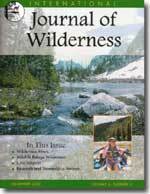 He calls upon readers to provide feedback and responses to their view of wilderness – especially with regard to the never-ending tightrope walk between the (perceived) needs of wild nature and the needs of humankind fulfilled by wild nature. Also in this issue, H. Ken Cordell and Jeff Teasley present the results from the USA National Survey on Recreation and Environment. One finding of the survey showed that in 1994-1995 almost 95% of the US population participated in some form of outdoor recreation. Managing Editor Michelle S. Mazzola captures some adventures of the IJW executive editors in the wilderness. Quotes from Alan Watson, John Hendee and others tell the story of wilderness advocate who “walk the walk.” Kristi de Groot presents highlights from the First Latin American Congress on National Parks and Other Protected Areas. Cuban Protected Areas, held 21-28 May 2977 in Santa Marta, Columbia. Participants discussed issues including: International Guidelines for Land Designation and Management, Indigenous Groups within National Parks and Protected Areas and Community-Based Conservation. Vance Martin presents the results of the 6th World Wilderness (Bangalore, India, 24-29 October 1998), under the leadership of Chairman Mr. Partha Sarathy of The WILD Foundation and Congress Executive Officer Mr. Krishnan Kutty of the National Outdoor Leadership School. Rob Cooley discusses how wilderness therapy can help troubled adolescents and Alan Watson explores sustainable financing of Parks and Protected Areas through user fees.